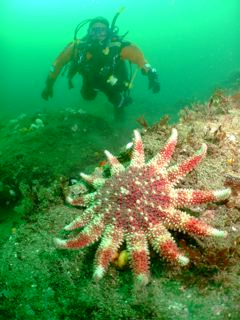 With a light offshore breeze and a blue sky, things were looking up for a good days diving. Members of Tyneside and Durham City diving clubs loaded their kit aboard the Aquanaut, Eyemouth Sub Aqua clubs venerable old dive boat. From Eyemouth harbour it was a gentle journey out and down the coast to the site known locally as Burnmouth caves. Dropping into the water we were rewarded by excellent visibility of around 10 metres plus. 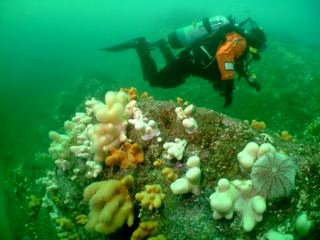 The wall on the south side of the caves is extremely scenic as it catches the full force of the tide and consequently is covered in a rich growth of marine life. Swimming around the corner we approached the entrance of the main cave, however, the dive is very safe as this is not an enclosed overhead dive which requires the use of torches and ropes. The cave rises several feet above the sea surface even during the highest of Spring tides allowing plenty of light to illuminate the bottom. 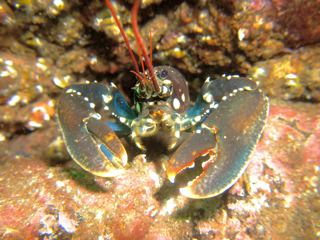 This dive was notable for the sheer number of small lobsters that appeared to be hiding in every available nook and cranny. 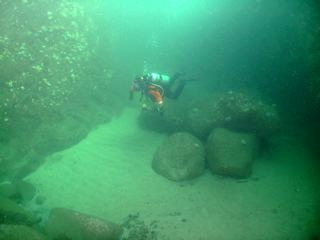 For the second dive we explored the smaller cave and the surrounding seabed. Here we came across some interesting rocky ridges and large boulders. 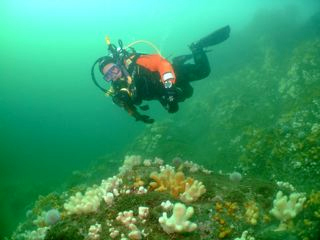 Numerous fish including pollack and wrasse were seen throughout the dive. Many thanks to Dave and Alex for organising the dive and skippering the Aquanaut.